PRESTIGE PACKAGE! Perforated Suede Int, S-LINE Pkg, Prestige Wheels, Flat Bottom Steering Wheel!! 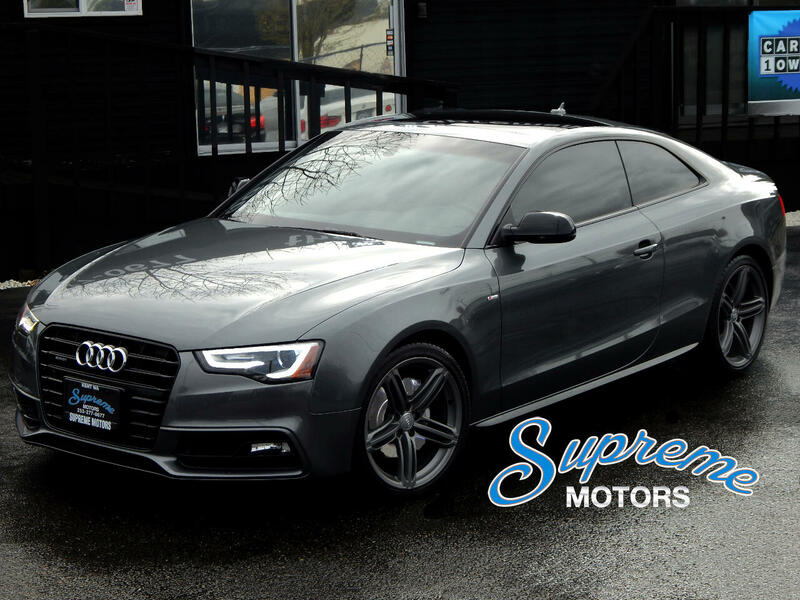 We have only had one of these A5 prestige s-line packages in this color. This particular color in our opinion is the nicest color in Audi. It is just so hard to find with the right packages and a west coast clean carfax. The Dark, deep, rich colored charcoal just looks second to none against any other color. It really is a must see in person to TRULY appreciate it. The black mirrors, and black side skirt are nice touches on the prestige package and the upgraded front and rear body kit on this prestige package is a game changer! The prestige wheels match the paint color and are one of the coolest stock wheels ever made on ANY car. The LED headlights are new age and will keep this Audi looking "new age" for many years to come. The interior is flooded with options and the prestige options put it over the top! The race inspired seats with the extra bolstering are a must on Audi's. They hold you in place much better and look way better aesthetically than the base Audi seats. They all dont have the suede inserts like this one does, and that is one of the options that sets it apart from the rest.... The color of this Prestige is still the coolest part of this whole car! The flat bottom steering wheel is also race inspired and is much thicker with softer leather. That steering wheel is one of the coolest steering wheels in the game. The s-line badges are littered throughout the car, and help make this A5 a special one. It is all about the details, and this one is all about details. The bang & Olufsen Sound system is second to none and blows away all the other sound systems in the car market. It is so crisp and clear, and costs $800 to $1000 more in the market with ANY Audi that has the Bang & Olufsen upgraded sound system. We pay for it too, and it is worth every penny! Also has navigation, AWD, back up camera, panoramic sunroof, 2 keys, heated seats, all power options, and more. We also offer extended warranties, and that will add much more value to any car purchase. With all these options, the crazy cool color combination, AWD, clean carfax west coast, and the prestige package in a great "price point", This is a lot of car and will make someone very happy when they get to walk up to this eye candy every day. This is a west coast owned so there is no rust/corrosion issues! Dealers can buy cars from Illinois, New York, East Coast, Midwest Michigan ect with rust for $2500-$5000 less than the same car but from the west coast. Not only is this a west coast car its a 1 owner with no blemishes at all on the Carfax. No accidents or damage reported, minor damages, rental car, or odometer roll backs. At Supreme Motors, we ONLY sell the best of the best and this Prestige Pkg A5 is another prime example of our meticulously inspected, coveted color combination, clean Carfax, and rare optioned inventory that we select for our new clients. This S-Line Prestige A5 checks every single box for it to be in the "unicorn in the market" status, which means you never see them with all these attributes combined for sale. Call soon because spring and summer are coming and it will be a heck of summer in this bad boy.